Global markets continued to rally in March as central banks – led by the US Federal Reserve – sounded an even more dovish rate outlook, and US/China trade talks appeared to be moving towards resolution. In the UK, uncertainty over Brexit contributed to a weak and volatile Pound and helped boost the more export-oriented FTSE 100 to a 3.29% monthly gain, while the FTSE 250 posted a marginal loss of 0.11%. AIM held its own, with a 0.94% gain in March. At the sectoral level, UK equities once again posted broad-based gains though both Banks and Travel & Leisure posted monthly losses. The Mining and Food & Beverages sectors were notable outperformers. Overall, UK economic data over the course of March came in somewhat better than expected, though consensus GDP growth forecasts for this year continue to be trimmed. The Bank of England’s hands appear tied in the face of Brexit uncertainties and interest rate expectations moderated over the month. However it does appear increasingly likely that UK will eventually have a ‘soft Brexit’. The Chancellor’s Spring Statement on 13 March was a low-key affair, though borrowing projections were significantly lower than expected despite a cut to economic growth forecasts. UK equity issuance continued to build in March having made a weak start to the year. The total of £2399m represented a 46.3% gain month on month and a 4.6% gain year on year gain – the latter gain being the first such since September 2018. UK markets continued to benefit from the ongoing recovery in global risk appetite in March. The US Federal Reserve completed the ‘dovish pivot’ it started in January by signaling that interest rates were likely to remain on hold through 2019. Meanwhile in Europe, both the European Central Bank and the Bank of England sounded a more cautious note. 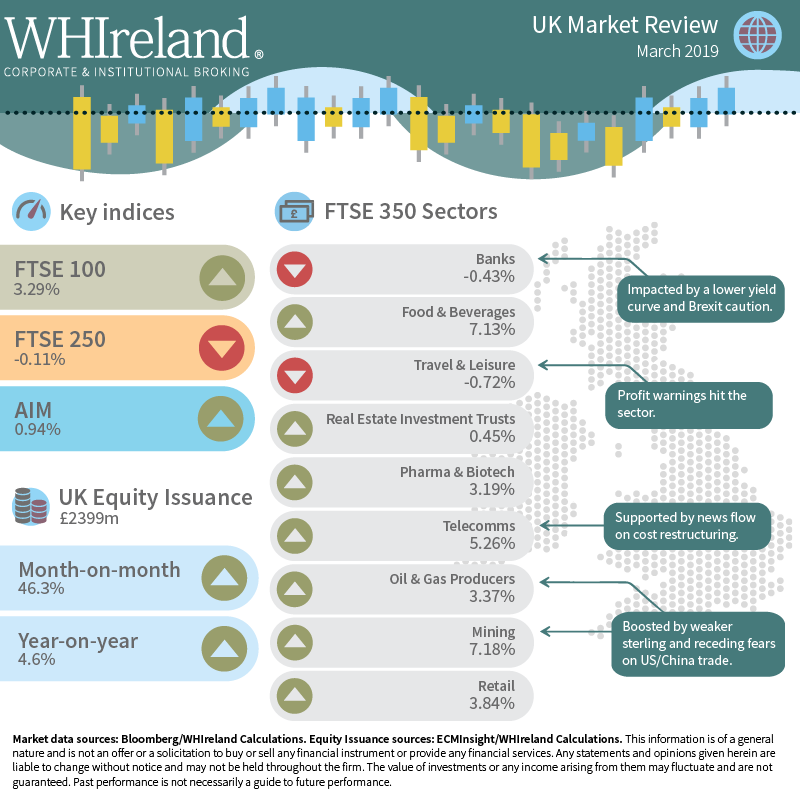 Brexit continued to play a key role in UK market performance in March with a series of superficially inconclusive parliamentary votes translating to a volatile and weak Pound. This helped bolster the more export-oriented FTSE 100 to a 3.29% monthly gain, while the more domestically-exposed FTSE 250 actually posted a marginal loss of 0.11%. AIM held its own, with a 0.94% gain in March, perhaps held back by an ongoing preference for liquidity. Ultimately, UK did not leave the EU on 29 March as (some) expected and the date for exit is currently 12 April, though the prospect of a ‘hard Brexit’ at that date is currently viewed as unlikely by market participants. Markets are still largely pricing in an eventual ‘soft’ Brexit and there is some evidence that international investors are selectively buying UK equities from a long-standing underweight position. Global market re-risking helped most UK sectors to a gain though individual company and sector themes also impacted performance, as did the impact of weaker sterling. Profits warnings in the Travel & Leisure sector helped deliver a 0.72% loss in March, while caution on the UK domestic economy and expectations of lower interest rates also held back UK banks (-0.43%). Other sectors fared somewhat better, with hitherto beleaguered Telecomms (+5.26%) befitting from news flow on cost restructuring. Food & Beverages also posted a strong performance, perhaps boosted by a flattening yield curve and the international exposure of the underlying companies. The sector gained 7.13% in March. Mining (+7.13%) benefitted from a combination of weaker sterling and improving sentiment on the future of US/China trade talks, as did Oil & Gas (+3.37%). Real Estate Investment Trusts (REITs) had a relatively quiet month, gaining just 0.45%, having previously enjoyed a strong bounce from the general market sell-off in December. The UK labour market is still outperforming expectations, perhaps supported by businesses substituting capital (investment) for labour. Business and consumer confidence surveys still suggest that sentiment remains fragile, though retail sales have recently evidenced a somewhat stronger bounce. Inflation data received in the month was somewhat mixed though overall held few surprises. Headline Consumer Price Inflation showed a small acceleration, while core CPI had a small dip. House price data was somewhat firmer than expected, however only wage data currently suggests that significant inflationary pressure is building in the UK economy. Despite the Bank of England’s obvious desire to forestall a broader inflationary pickup by raising interest rates, their hands are largely tied by ongoing Brexit uncertainties. Market pricing of the probability of a UK rate hike by December 2019 fell from c. 50% to c. 10% over the course of March, though such expectations have been quite volatile in recent months. The Chancellor’s Spring Statement on 13 March was a relatively low-key affair. It confirmed that public borrowing was likely to undershoot last October’s forecast for the 2018-19 fiscal year. However it also projected lower borrowing over the medium-term, despite cuts to growth forecasts. The market impact of this was mitigated by the substantial Brexit caveats attached. UK equity issuance gained significant momentum in March having made a weak start to the year. The total of £2399m represented a 46.3% gain month on month and a 4.6% gain year on year gain – the latter gain being the first such since September 2018. Encouragingly, the breadth of activity showed signs of improvement. March saw the deal count increase to 27 from the 19 registered in February, though this still compared somewhat unfavourably to the 37 transactions registered in March 2018. Sectoral representation also increased from 12 to 18 (and up from 14 in March 2018). Superficially, the sectoral concentration of activity appeared even higher in March than it did the previous month with 47.3% of deal value being accounted for by the launch of a number of listed equity funds. However this could be viewed within the broad context of the global rally in risk appetite. Software and Computer Services, Oil & Gas Producers, Technology and Hardware & Equipment, Travel & Leisure, Real Estate Investment Trusts and Industrial Metal & Mining offerings also made significant contributions to activity. Together with Equity Investment Instruments, these sectors collectively accounted for 85.7% of monthly transaction value.